The experienced actor behind Dos Equis’ viral ad campaign on popularity, influence, and saving endangered Siberian tigers. Consider for a moment the manly purr of Old Spice spokesman Isaiah Mustafa’s “Hello, Ladies” salutation. It’s seduced the country social media-style: 94 million views on YouTube, 630,0000 Facebook fans, and an estimated 1 billion aggregate impressions in just one week. But wait. It appears consumers may have been too distracted by his glorious swan dives and monocle smiles to remember the actual product he was hawking. Sales of Red Zone body wash have actually declined 7% according to a report by SymphonyIRI. (UPDATE: A spokesman for Old Spice claims Brandweek took SymphonyIRI’s stat out of context. 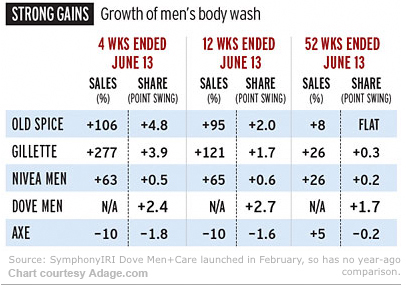 Citing Nielsen figures, the rep says OS body wash sales have actually increased 11% in the last 12 months.) And the towel-clad and deep-voiced Mustafa may have not even contributed to Old Spice’s overall sales growth, which Ad Age chalks up to a high-value coupon campaign by the company. Both Nivea and Gillette saw similar if not higher growth during that period, and neither had the help of Mustafa–just coupons. So did Mustafa’s unprecedented popularity fail to translate into influence? Is there perhaps another equally viral ad campaign, one with a frontman who rivals Mustafa’s dash and flair, that has helped move units? Unfortunately for The Man Your Man Could Smell Like, there is: The Most Interesting Man in the World. Since he joined forces with Dos Equis in 2006, sales have shot up significantly every year, leaping 26% since January alone, Dos Equis brand manager Ryan V. Thompson recently told me. “We’re now the fastest growing beer import in the country,” he says. Adding insult to injury, there’s no question who would win a staring contest. I decided to track down The Most Interesting Man in the World and speak with him about viral advertising for our chronicle of the social graph, The Influence Project. Why has The Most Interesting Man succeeded where Mustafa has failed? Is there anything The Most Interesting Man in the World could learn, then, from The Man Your Man Could Smell Like? Would he ever try Old Spice Red Zone Body Wash After Hours? Breaking character for a moment, Goldsmith explains, “I think the campaign is so successful, because every man, including me, would like to be like him.” He also credits the brilliant writers behind his clever lines and the company itself for keeping up the character. And this is a guy who knows characters. His credits read like a greatest hits collection of ’70s and ’80s television, with guest-starring roles in everything from Hawaii Five-O to Eight is Enough, CHiPs to Partners in Crime, St. Elsewhere to Trapper John M.D., Charlie’s Angels to Highway to Heaven…. You get the picture. “Dos Equis is very wise to keep the mystique going,” he says. “The Most Interesting Man is not just a talking head–he’s not a conventional spokesman.” Goldsmith even admitted that he was surprised Old Spice’s campaign hadn’t translated into sales.